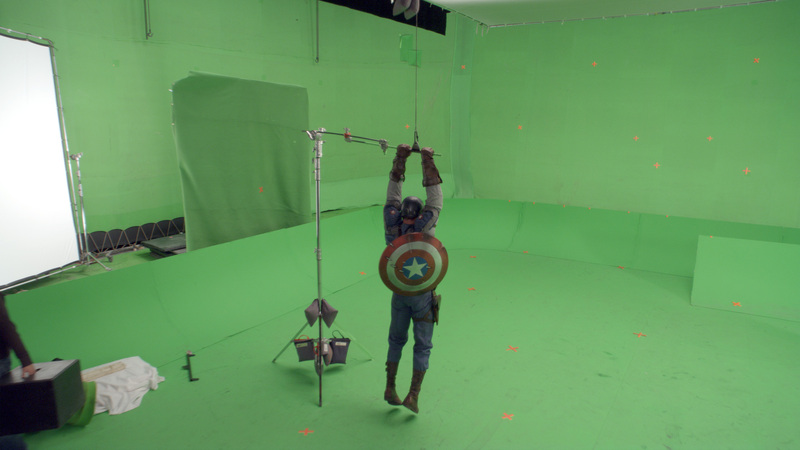 With T-minus two days remaining before Marvel’s Avengers: Endgame hits theaters, here’s a behind the scenes shot from one of the Infinity Saga’s first entries – 2011’s Captain America: The First Avenger. Pics from a Creative Cow story on the film’s visual effects. Check out more Pics of the Day. I missed the final chapter of M. Night Shyamalan’s Unbreakable trilogy in theaters, but as of yesterday Glass is now out on home media. 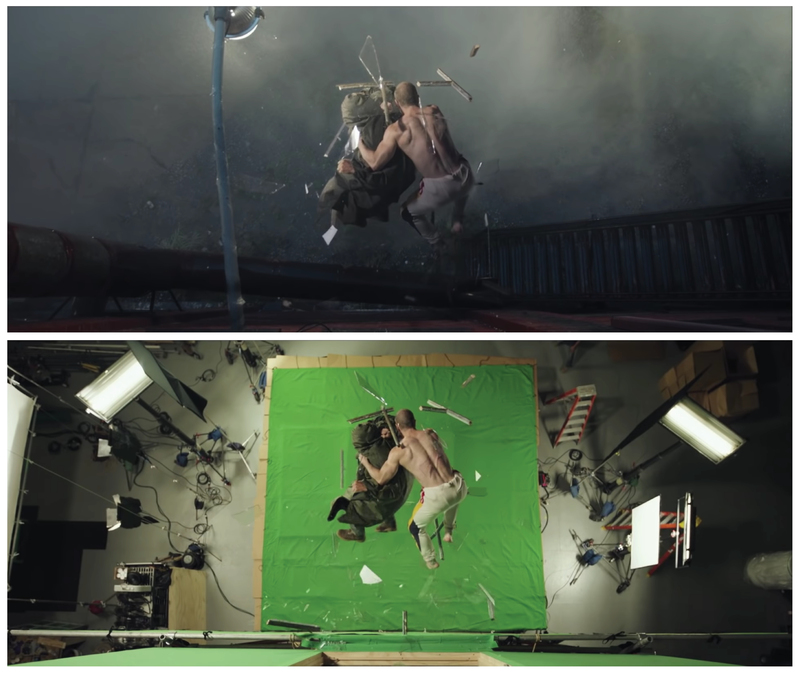 Here’s a before-and-after VFX shot from the film, which – like Shyamalan’s previous two efforts The Visit and Split – was self-funded by the director. Check out more in the Shot Behind the Shot series. 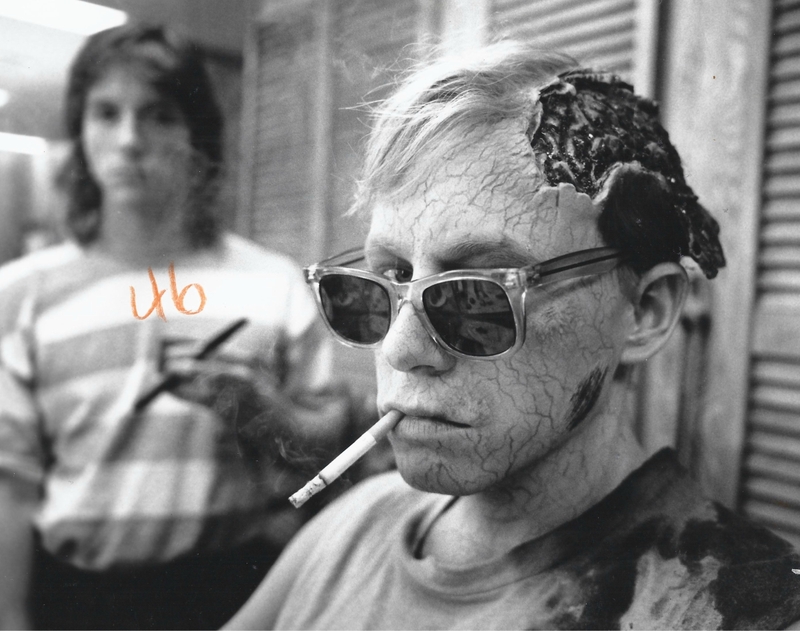 (Above) Actor Brad Greenquist in the makeup chair for his role as rotting corpse/guardian angel Victor Pascow in the original Pet Sematary (1989). A remake from Starry Eyes directors Dennis Widmyer and Kevin Kölsch arrives this week. Both films are based on Stephen King’s 1983 novel, which was inspired by a similarly misspelled graveyard for neighborhood pets located near a house that King rented in 1978 while teaching at the University of Maine. (Above) Behind the scenes of a practical effect from The Stuff (1985), a sci-fi/horror satire about a deadly dessert written, directed and produced by the late great Larry Cohen. Cohen passed away Saturday at the age of 77. Though he never quite received the plaudits of George Romero, Cohen also specialized in B-movies laced with social commentary. Here’s Cohen on the subtext of The Stuff, from an interview with Diabolique Magazine. Diabolique: Some of your films from the ‘70s and ‘80s reflect New York as a corrupt, dangerous place. Were there any notable events that occurred in the city back then that had an impact on you? Cohen: It wasn’t just New York. Things were going on all over the country and the world that I wanted to try and deal with in my films. Take The Stuff, which was about products being sold on the market that kill people. There are still so many products like that being sold today. In those days you still had cigarettes being advertised on television. Nowadays it’s not cigarettes, but it’s medication that’ll probably kill you just as fast. As a matter of fact, every time they advertise a different pill of some kind they have a disclaimer afterward telling you all the side effects — like death. So, The Stuff was an allegory for consumerism in America and the fact that big corporations will sell you anything to get your money, even if it’ll kill you. 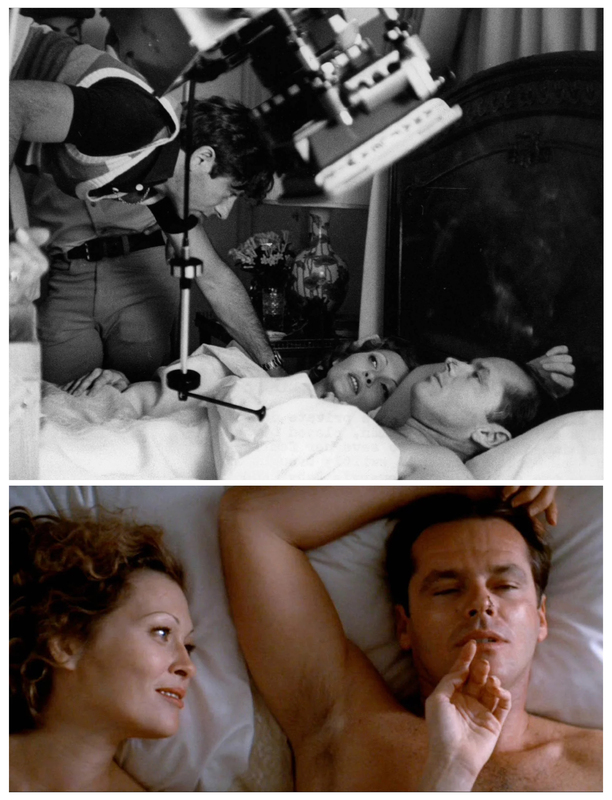 American Cinematographer recently shared its original story on 1974’s Chinatown, which was penned by the film’s director of photography John A. Alonzo (The Magnificent Seven, Scarface, Harold and Maude). Alonzo took over for Stanley Cortez two weeks into filming. 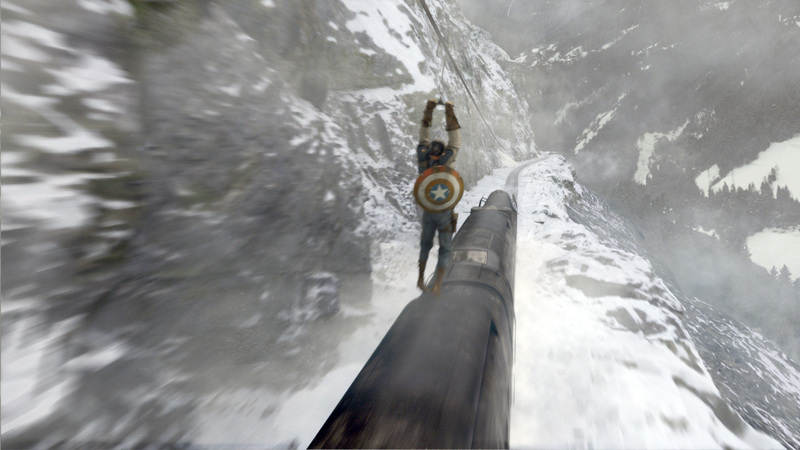 “A shot like that isn’t easy to pull off. First of all, there’s no room for the assistant to follow focus, because the camera is surrounded by the actors and extras. There’s no place to put lights on them, because when you have a camera that is that close, with a 40mm lens and an actor who is two feet away from you, your own camera would cast a shadow on the actor if you put any lights behind it. To solve the lighting problem, I mounted the little Obie light next to the lens, ran the wire down to my feet and taped it so that Earl Gilbert could keep his eye on it constantly and keep it up. We pre-checked the exposure wherever possible. The next problem was that of following focus. Well, relying on my experience as a documentary cameraman, I asked permission of the union and they allowed me to operate the camera on that shot myself, because I can do that sort of thing. The next problem was what to do about the damned camera shadow. Roman came up with an idea. He said: “Put a hat on the camera. You’ll see a shadow if you look at the picture closely, but it will look like a hat shadow.” We put a hat right over the Obie light, so that any lights that hit me as I was panning around, cast a shadow that looked like somebody’s hat. 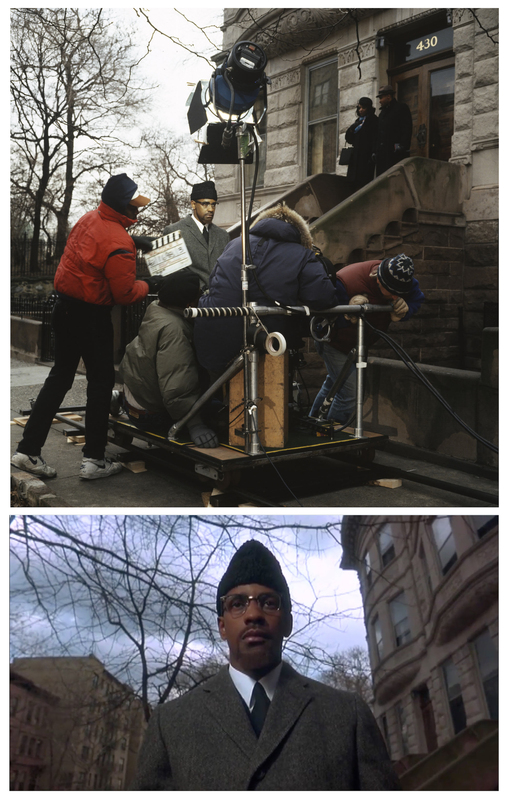 Few directors boast an instantly recognizable signature shot, but Spike Lee and his “double dolly” are among that select company. The technique involves placing both the actor and the camera on dollies – allowing them to glide along the dolly track in unison. My favorite of these shots comes courtesy of cinematographer Ernest Dickerson in Malcom X (1992), as Denzel Washington (in the titular role) is propelled toward the fateful rally where Malcolm was assassinated in February of 1965. The scene is accompanied by Sam Cooke’s A Change Is Gonna Come. The Civil Rights anthem was released as the B-side of the single Shake only 11 days after Cooke himself was shot and killed under suspicious circumstances in December of 1964. Behind the scenes of F.W. Murnau’s 1927 silent classic Sunrise. The film took home three Oscars at the inaugural Academy Awards, including Best Cinematography, an honor shared by Karl Struss and Charles Rosher. Both men worked into the 1950s and earned an additional eight Oscar nominations between them. 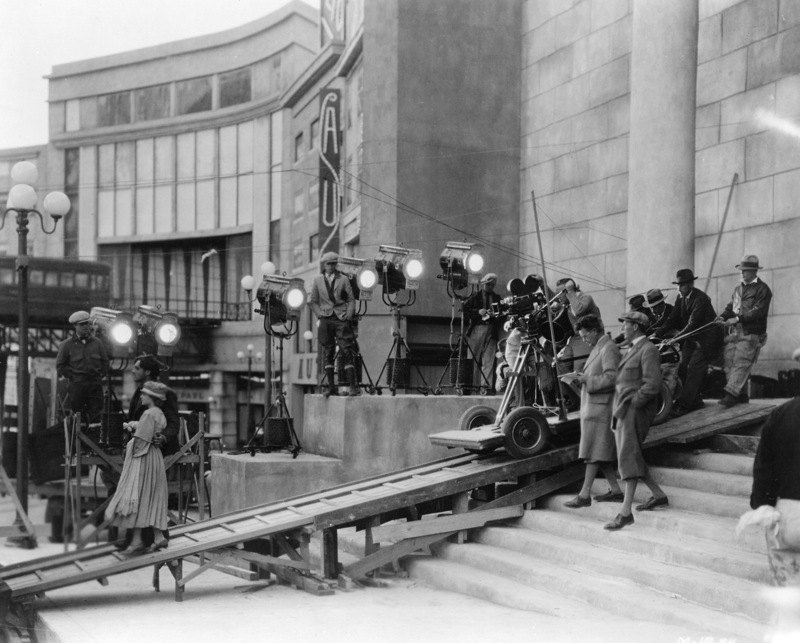 In the image above, via American Cinematographer, that’s Struss with the notebook walking down the steps next to Murnau. Rosher is riding the dolly with the camera. 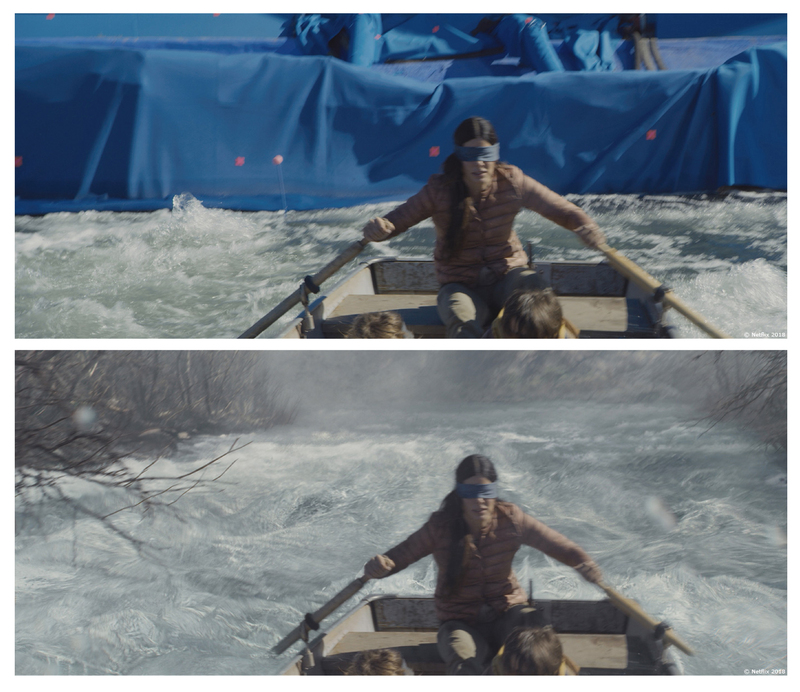 (Above) A before and after VFX comparison from Netflix’s Bird Box (2018), which finds Sandra Bullock and two children traversing river rapids blindfolded. The movie is set in a creature-ridden post-apocalyptic nightmare where even a glimpse of the outside world results in almost instant death. The practical portions of the aquatic action were shot on location on the Smith River in Northern California. The water tank work was completed over the last two days of principle photography in a tank surrounded by 200′ of blue screen, with 300,000 gallons of water tinted to match the color of the Smith River. The pics above come from the awesome site Art of VFX, which detailed the making of Bird Box via an interview with VFX Supervisor Marcus Taormina. Check out more of the Shot Behind the Shot series here.